It might come as a surprise to most guys, but there is a proper way to be combing your beard each day. Chances are you made it through the growing stages and have endured that scratching and itching beard phase, so now you want to be able to show off the fruits of all that labor. Combing the beard correctly will not only improve the way your beard feels, it will definitely improve the way you feel. If your first instinct is to grab some ordinary, cheap comb from a supermarket and use it on your beard – just don’t do it. There is nothing worse you can do to your facial hair. It is better not to comb your beard at all than to comb it with a cheap plastic comb. The best thing you can do is choose a reliable comb designed explicitly for beards. Finding the right facial hair comb largely depends on the coarseness and the length of your beard. 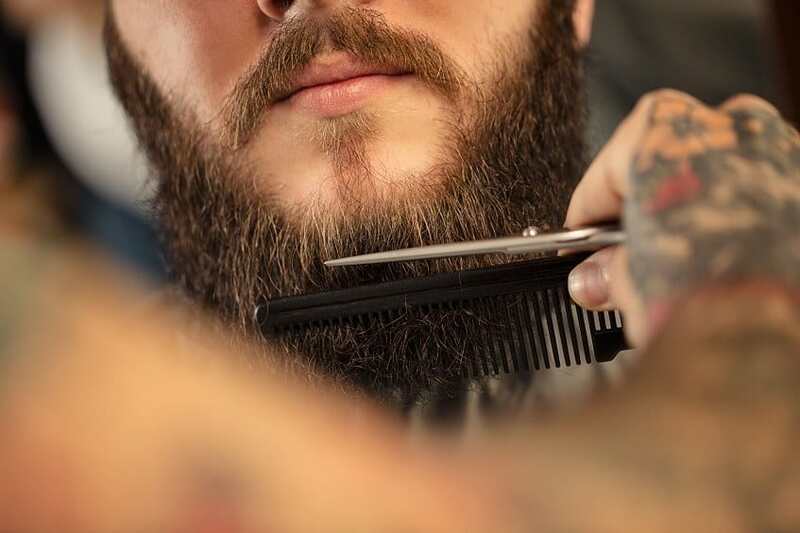 There are three critical differences between standard combs and beard combs that you should understand – the production process, the material from which they are made and teeth width. Cheap combs are made on a large press, that stamps them out of a mold. Therefore, these combs have a lot of microscopic jagged edges along each tooth. What does this mean for your beard? Nothing good, that’s for sure. Once you run this comb through your facial hair, it will tear apart your hair follicles. This will further lead to breakage, beard split ends and static. While there are a few ways to deal with split ends, the most effective one is cutting off the tip of your beard. You’re now probably thinking that trimming facial hair is a normal process. And you are right, but when you develop split ends, you will be forced to cut your beard more frequently than necessary. Static and friction are also things you will experience if you decide to comb your beard with an ordinary comb. The cheap comb will electrify your beard which will create a lot of stray hairs in it. Last but not least, plastic combs are cheap for a good reason – their teeth usually break very easy. This is more prone to happen when you are storing the comb in your pants pockets. Specialized combs for beards are designed to allow you to carry them around in your pockets easily. When one or more teeth of cheap combs break, the damage to your beard will be even worse as the comb will pull and tug the hairs more than before. Before you realize it, you will have to revisit your local store to buy another comb, which means that you are actually not saving any money, as you thought you would. Combs made specifically for your beard are usually made of wood or horn. These materials are sturdier than plastic, which makes them stronger and more durable. Also, each tooth on it is individually saw cut and then polished. This process eliminates the jagged edges, and the result is a smooth combing experience. The teeth of a beard comb cannot be moved easily with a finger, while with a cheap plastic comb this will happen consistently. Beard and head hairs are different, in a sense that beard hairs are much coarser and that’s why you need a comb whose teeth won’t bend. Just one of the reasons why hair comb is not a good choice for facial hair combing is the space between its teeth. Teeth on hair combs are not spaced enough to glide through the coarse beard hairs. This being said, beard combs have various spacing, and this allows them to glide effortlessly even through the thickest and coarsest beards. However, have in mind that you should choose a comb while taking into consideration the density and the length of your beard. For example, if your beard is curly and coarse, a comb with wider spacing between teeth is the best choice. For softer beards, combs with teeth that are more close will work better. For a short beard that is also soft, you need a comb with closer teeth, while long and dense beard requests wider space between its teeth. All facial hair combs are made by hand, but the materials they are made from vary. Materials from which combs are made are wood, metal, and cellulose acetate. Wood is the most common material, and it’s the best choice for a beard comb. This is the type of material that every serious bearded man would recommend because there are more benefits of wooden combs than it meets the eye. Pros of wooden combs are numerous. The first thing you will notice is their appearance, and they all look great simply because they are carefully hand-crafted. The width between their teeth varies depending on the type of a beard you want to comb with it. They are also cut by hand, and the goal is to avoid the rough edges. If the edges of a comb are not smooth, it will pull and tug your beard leading to breakage. Fortunately, this almost never happens with wooden facial hair combs. The only downside of these combs is that they’re not waterproof. However, there are wooden combs of different quality, which you should consider before buying one. You know how you should avoid plastic combs by all means? Well, you should do the same with metal beard combs. Their edges are very rough, and they will damage your facial hair follicles, but also cause beard friction and static. Enough reasons not to use them on your precious facial hair. Cellulose acetate is similar to rubber, and some beard experts consider that it’s one of the best materials for facial hair combs. These beard combs are very easy to clean, and they don’t cause beard static and friction. In which direction you comb your beard will determine whether it will grow in the desired direction or not. Also, if you’re combing your beard right, you won’t have to worry about it getting damaged. Combing a beard is not an easy process, especially if you are a rookie when it comes to beard growing. One of the things you may find a little challenging is a process of conditioning your beard before you start combing it. This is necessary if you want to avoid snags and tangles. Tangles can damage the teeth of more fragile combs, but they can also damage your beard as well. To prevent this from happening, you have three available beard conditioners at your disposal: beard oil, beard balm, and anti-tangle sprays. They all work great, and which conditioner you will choose, depends mostly on your preferences. Once you condition your beard, use beard wax to hold your beard in place. If you skip this step, throughout the day, your facial hair will get tangled again. This happens when your beard rubs against your neck, chest or other beard hairs, and with the use of beard wax, you will avoid this. So before we discuss the five essential benefits of combing your beard, let’s first talk a little about the proper way to comb that facial hair. It can’t be repeated enough, but choosing a comb with the right teeth is essential. Wider teeth comb will glide through your beard easier. However, it also has to have smaller teeth for mustache combing. Take into consideration the material from which a comb is made. Plastic is the wrong choice, for example, because it causes static, snags and it damages your beard. Start by combing the beard from the bottom and coming upwards and outward. This process should begin at the neck and work towards the cheeks and chin. By combing this way you will separate all the facial hair so the beard appears fuller. There is a possibility you will run into some snags in your beard while combing it. Don’t try to tug and pull at them. Instead, slowly and gently come through the snag. Usually, those snags are just a few hairs crossed one over the other. Beard oil is a great way to deal with snags, and when used in combination with a comb, it can help easier comb sliding through your beard. Once the entire beard has been brushed upwards, now begin combing the beard down so that you can style it in the manner you like. Don’t forget to comb that mustache off to the sides and away from your mouth. Never comb your beard to aggressively and also avoid passing the comb very fast through your facial hair. The proper technique is to comb the beard gently and slowly. Now that you understand how to comb the beard, let’s talk about the benefits of combing your beard. Those little bumps and red spots around your cheeks and neck are simply ingrown hairs that curled around and began growing under the skin. Combing the hair each day will ensure all those facial hairs will grow in the right direction so you avoid those unsightly and painful ingrown facial hairs. In order to give that appearance of a fuller beard, all those hairs need to align perfectly with your face. When you comb your beard each day, you are in fact training different hairs to grow in different directions. 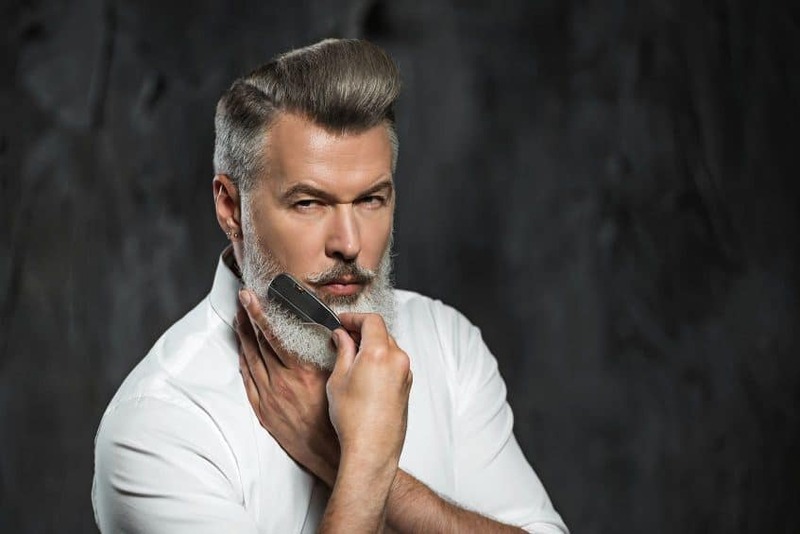 Just like how combing the hair on your head will cause hairs to grow a certain way, in order to have a fuller and manly beard, combing is absolutely essential every day. Combing the hair around your mouth each day not only trains the hairs to grow around the mouth, it will help to reduce all those food particles from getting trapped in the facial hairs. Nothing can take away months of work like looking at a beard that has little food particles trapped everywhere. 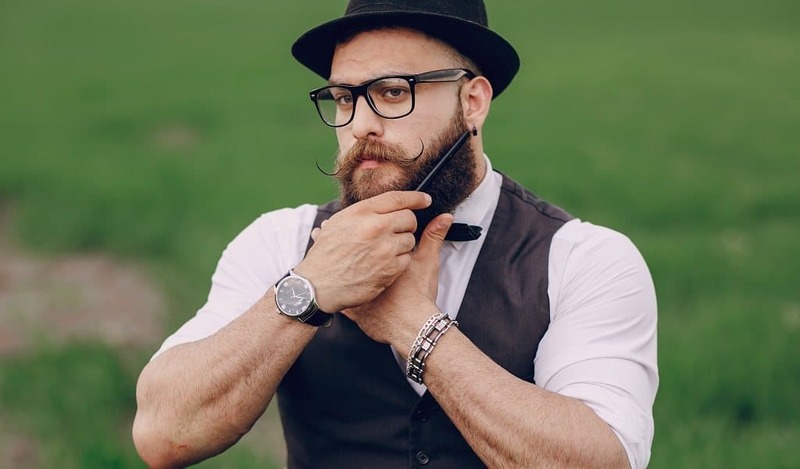 By now you know how important it is to apply a beard balm or beard oil to the facial hair to help it stay healthy and strong while ensuring the skin below is adequately moisturized. There is only so much that you can reach when you apply the product to your palms and rub into the hair. When you comb your beard each day after applying the beard moisturizer, the teeth of the comb will evenly distribute this product to the areas that need it the most. Whether you have good or bad hair genes, the only way that you can style your beard to get the desired look is by combing the facial hair. When you shape the hair with a comb, you can style that look any way you choose. Stop combing for a while and you will realize how unmanageable and out of control that facial hair can become. If you want a certain style, combing the hair each day is the easiest way to achieve that desired look. Now that you know about the benefits of combing your beard, don’t just grab any cheap comb or use the one that you use for the hair on your head. 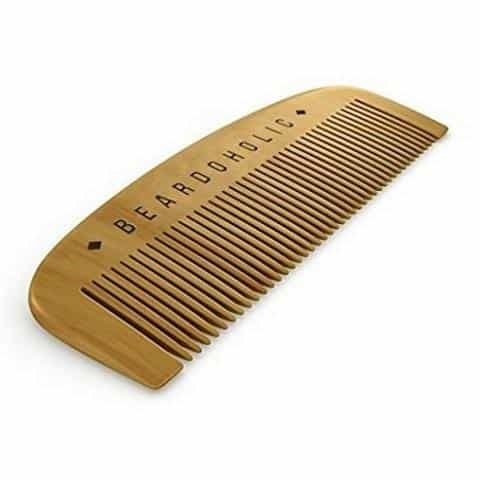 Find yourself a high-quality facial hair comb that is specifically designed for working through tangles effortlessly without pulling hairs out by the roots. Work your combing routing in right after you apply your beard conditioners each day and you will have that manly beard that will command attention. 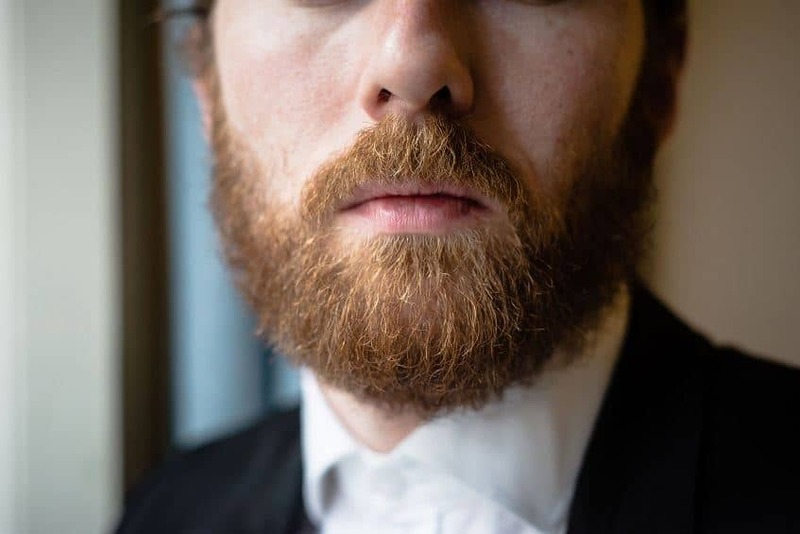 Although combing a beard has a lot of benefits, the time you choose for this will tell the difference between a mediocre and a great looking beard. So, the best time to comb your facial hair is after the shower. But don’t do it right after the shower, because that’s the time when your beard is still wet. Combing wet hairs almost always results is hair loss. If you don’t have a thick facial hair, combing your beard when wet will make it even less dense. A better tactic is to get out of the shower, pat dry your beard with a towel and then let it air dry for a couple more minutes. After that, apply a high-quality beard oil, and then run your beard comb through the beard. Beard oil will moisturize your facial hair and prevent your beard hairs from being pulled or broken. If you are using a hairdryer, don’t comb your beard afterward. This is similar to wet hair. While your beard is still hot, its hairs are much weaker than usual. If you try to comb your facial hair then, you are risking to pull the hairs from their routes. By now you probably want to know: How often should you comb your beard? When brushing your beard, one time a day is enough. If you do it more often, you will damage it. On the other hand, you can use a comb 3-5 times a day, and this won’t create any damage to your beard. Everything more than 5 times a day is overcombing, and you don’t want to do this. There are a few things you should consider when deciding whether you will use a comb or beard brush. It’s true that their goal is the same – to make your beard smooth and free of tangles. However, there are more differences between these two beard care products. First is the material from which they are made. Beard brushes are often made of animal hairs like boar and horse hair. Boar bristles are proven to be better in reducing frizz and tangles and redistributing beard oils evenly through the beard. Combs are made with hard materials, such as sandalwood and pearwood. These woods are made to be more durable and to prevent static while you comb your beard. Portability is the second difference between beard brushes and combs. Because facial hair combs are much thinner than brushes, they are also more portable. You won’t be able to store a beard brush into the pocket, but you can do so with a comb. Facial hair comb is good for styling a beard, and it’s also of great help in shaping your beard as it grows longer. When you’re trimming your facial hair with a beard trimmer or beard scissors, a comb will help you by providing more control and accuracy. In the end, everything gets down to your personal preferences whether you are going to choose a comb or a brush. 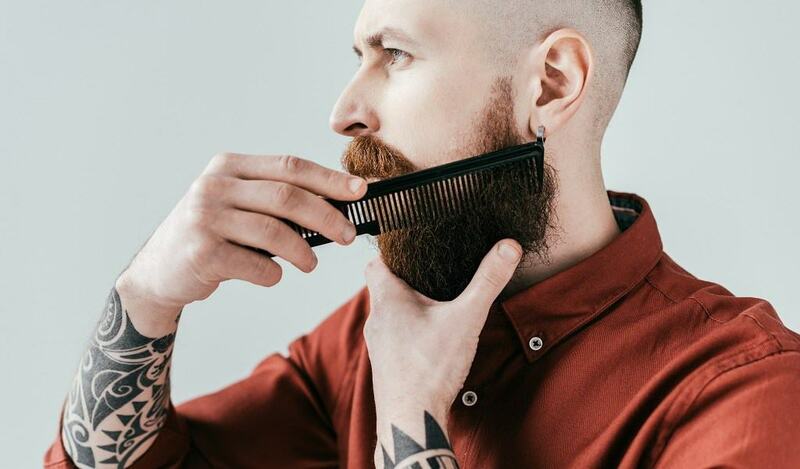 Most men use combs to get rid of knots and tangles in their beards and for styling purposes, while they use beard brush to train the hairs to grow in the desired direction. Cleaning a beard comb is vital because dirty combs will make your beard greasy and transport food parts and dust back into your facial hair. This will create more problems with your beard. On the other hand, a clean comb will make your facial hair smooth and neat, and force it to grow in the desired direction. Now you know the importance of cleaning facial hair combs, so it’s only fair to explain the process itself now. The only cleaning tools you need are a liquid soap and a toothbrush. The first thing you should do is to put the soap on each side of the base of your comb. By using your fingers, spread the soap between comb’s teeth and rinse it immediately with warm water. You will notice that there are still some soap leftovers, but nevertheless, you should add more soap. After that, using the toothbrush start cleaning it from its base and move toward the end of comb’s teeth. This should be done under the running water. Rinse all the soap with the toothbrush until you notice that all the dirt build up is removed. To finish, pat dry your comb. This process is almost the same when cleaning any beard comb, with slight adjustments for fine tooth and wooden combs. In case of fine tooth combs, you should spend more time in rinsing the comb with a toothbrush. The goal is to really get between each tooth so that you are sure there isn’t any dirt left. Wood shouldn’t be submerged in water for too long, or it will splinter and swell. You should also make sure that you have removed all the water from it. The good news is that you don’t have to clean beard combs too often. If there is not visible debris build upon it, don’t clean it just yet. Optimally, beard combs should be cleaned about bi-annually. Don’t skip this process if you want to double its lifetime. Photos from: Dmytro Sidelnikov © 123RF.com, luckybusiness © 123RF.com, Eugenio Marongiu © 123RF.com, Y-Boychenko / depositphotos.com and prostooleh / depositphotos.com. Best Beard Vitamins – Do They Really Work? Does anyone use hair spray to hold the shape/style or is this a definite no-no? I use beard balm, homemade is so much better than store bought. It holds my beard fantastically. Hair spray is not good for your beard, it’ll probably dry it out. Hope that helps. Is it okay for the beard if I choose to use both brush and comb? Brush at home, comb outside.